The Organized and Inspired Scrapbooker was an extremely popular book by Aby Garvey and Wendy Smedley that has been out of print and available for quite some time. However, CK Media has given it a face lift and it is now again available to help the seriously unorganized scrapbookers among us! While the content is EXACTLY the same as the original, there have been one change - the size and cover on the book. While the original was a square, hard-covered, spiral-bound book, this new edition is the more traditional among scrapbooking idea books in that it is rectangular and soft covered. Cost wise this can actually be a benefit as they were therefore able to lower the initial price. I actually reviewed the original edition on my blog and you can read the review here. I have this original edition and love it. If you've followed my blog for awhile, you might remember that I had the wonderful opportunity of meeting Wendy at a crop a couple years ago and was gracious enough to even sign my copy! I will NEVER part with it!!! 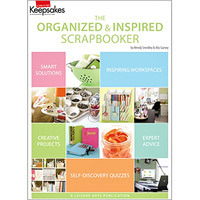 The Organized & Inspired Scrapbooker is currently available through the CK Media store for $16.95 or on Amazon.com for $11.16. If you'd like to see more on organization from CK, they are actually currently hosting an organization week on their blog. Check it out! I have one copy of The Organized & Inspired Scrapbooker to give away to one lucky reader! Simply leave a comment to this blog post answering the following question by 5 p.m. (CST) on Thursday, January 20th, 2011 and you'll be entered for your chance to win! Please include your letter answer and feel free to elaborate. How organized is your scrapbook space/supplies? A. My space is a hopeless mess! B. Sure, it's a little messy, but I can still see most of my table top and floor. C. My space is organize well almost all the time...except maybe right after I finish a project. D. I live by the motto: "A place for everything and everything in its place!" Random.org will choose and I will announce the winner on Friday, January 21st, 2011.